As German immigrants settled the here in the 1860s, they immediately recognized the area’s beer brewing potential. The many fresh springs would provide good water for brewing, and caves dug into the hillsides would provide cool storage facilities. The first brewery to open was Bechtel, and several others soon followed, the largest of which was the R & H Atlantic Brewery. Several bottling companies flourished alongside the breweries, and by the 1870s, Stapleton was the commercial center of Staten Island – with its well-to-do residents living in grand homes along St. Paul’s Avenue, and its workers living in the “workers’ cottages” downtown. In 1898, upon consolidation of New York City, Staten Island became a borough of Greater New York. Ten years later, a municipal ferry service was opened between Manhattan and Staten Island. Two boats – the Stapleton and the Castleton – ran between Whitehall in Manhattan and Canal Street in Stapleton. But the ferry service was quickly abandoned in favor of an international marine terminal during the 1920s. A string of 17 piers was constructed, along with multistory enclosures and docks. A 50-acre landfill was also built in the water to provide railroads and trucks with access to the ships. Unfortunately, the project separated and blocked Stapleton from its waterfront, thereby stripping the town of much of its intrinsic charm. All that remained of the natural beauty were the hills, woods, animals, and trees. But these were enough to inspire concerned residents to resuscitate the Stapleton that had once been. In the 1970s, after the pier enclosures were finally torn down, the Stapleton community began to rebuild itself – a process that continues to this day. The City of New York acquired this land, from Meadow Street to Hill Street just west of Tompkins Avenue, in 1947 to be jointly operated by Parks and the Department of Education. Construction began in 1949, and the site was opened to the public as the P.S. 14 Playground on March 3, 1951. It offered students and local residents a large variety of recreational facilities throughout its three separate sections. One section contained a wading pool, bicycle rack, comfort station, sand pit, swings, slides, and seesaws. A second contained basketball and volleyball courts, a pipe frame exercise unit, more slides and swings, two shuffleboard courts, and a paddle tennis court. The third contained four handball courts. A drinking fountain, flagpole, and several benches were also installed throughout the park. At the time, this was the 539th playground in the city’s park system. 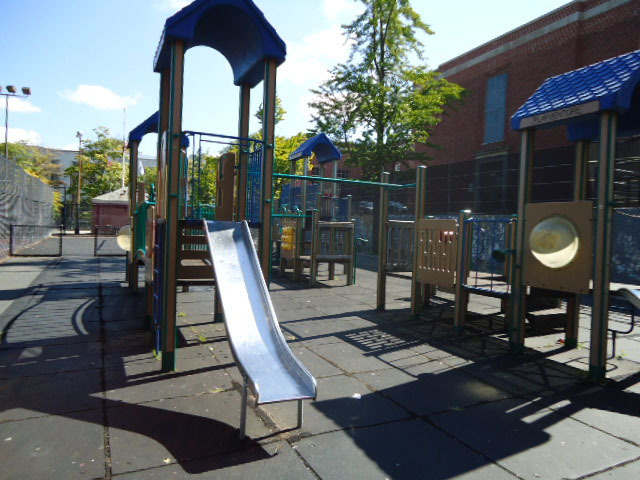 In 1996, Commissioner Stern changed the name of this property to Stapleton Playground. A year later, a renovation of the site’s handball courts, pavements, and fencing was completed. Mayor Giuliani funded the $70,513 renovation. Also in 1997, $500,000 from Borough President Guy V. Molinari provided new play equipment, basketball courts, game tables, and a spray shower in the shape of a bird. Most interesting, perhaps, is a tic-tac-toe board that plays music when in use. These recent renovations followed a $270,000 restoration in 1993 on the ball fields north of the play area, and a renovation of the basketball courts. The playground is now colorful, and the youngsters who frequent it consider it a happy place in which to spend time and enjoy themselves.